There’s something to be said about being distracted while reading any book, no matter the type of distraction, or the type of book. If the book is bad, you may become very readily distracted and then never bother reading/finishing said book. If the book is mediocre, yet still enjoyable, you become distracted, still finish the book, but look back on it and wonder what it was actually about. If the book is good, you will either get annoyed because you don’t have time to finish reading it, or you’ll just keep struggling along to finish the book even if you have to read bits and pieces at a time and reread bits and pieces over again because the distractions are actually quite distracting. On the other hand, I kind of recognized that Exposed is a well written book, with a smooth, straight-forward progression, and the criminal case encompassed in the story is intriguing enough to keep me hooked. But, possibly due to distractions, I was somehow just not feeling the excitement or the book itself. And this could be due to a plethora of reasons: multiple distractions in Real Life, maybe the book really was just plain boring, or maybe I just couldn’t find a way to relate with the characters (as much as you can relate to Romantic Suspense heroes and heroines, I suppose). I DO know that I had been very intrigued by the main character being a forensic photographer. But aside from the criminal aspect, the rest of the book just felt flat. Maddie Callahan might have witnessed or captured a violent crime happening during one of her freelance wedding photo shoots--an unknown situation that puts her life in danger. What she doesn’t know is what she might have seen or even what she may have evidence of in her photographs. FBI agent Brian Beckman has been investigating a violent criminal, known only as Doctor. A couple young women have died and his only possible witness has just disappeared, abducted on his watch. And the key to finding out who has taken this woman and where she might be lies in what Maddie may have inadvertently seen. To be honest, the book was actually not bad. But as I already stated above, I couldn’t seem to focus on it. 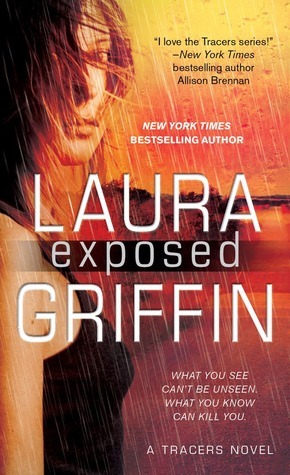 Exposed has a good premise and Laura Griffin’s writing style has improved a lot since her first few books, pre-Tracers. And even the romance in Exposed was a quietly sweet one with the obligatory hitches and misunderstandings and damsel-in-distress scenes. The story is straight-forward, but the rest of the book feels a little too formulaic. I’m not sure I can pinpoint where it is that I lost interest in anything to do with Maddie or Brian. And while I still enjoyed the crime thriller aspect, I can’t say that it’s the best Romantic Suspense in the world. But I also can’t say that this was a bad book either, because it’s not. In the end, it was simply a nice rainy-day read, fairly enjoyable for anyone who loves a good Laura Griffin book. Maddie had her moments, Brian’s a good guy, the story told a story. In the end, it’s all still good.